As of this morning, there are 400 people out in Facebook Land who have pushed the 'Like' section on our farm's page. We are surprised, honored, and thank them very much! I know the 2013 garlic marketing season seems like a long way off from now, but we hope most of them are local enough to shop with us, will introduce themselves next year at our market tables, and will also introduce themselves as one of our Facebook garlic fans. Here is another new bumper sticker I found myself thinking about during one of those 2 AM wide awake nights - "Know your farmers and know your eaters." Creating a healthy community is a two-way street. There is much discussion and anguish over the fact that most people are disconnected from and do not appreciate the sources of their food as one reason for the development of the current agriculture and food system that is clearly unhealthy in more ways than I will elaborate on right now. However what most people do not appreciate is that the vast majority of farmers are also disconnected from their eaters. Most are selling the crops they raise as 'ingredients' (the corn, soy, wheat crops) or selling food to be eaten to the processors and/or wholesalers so that you can pick it up in a grocery store. I learned a generic phrase for this type of growing and selling as "selling to the river" when reading Sandra Steingraber's book Living Downstream. Several people have asked me, either directly or indirectly, if my husband and I "have to be doing this". In each case, the situation has never been fully right to have a lengthy, in depth, and honest heart-felt discussion about "have to" versus "want to be doing this" (by which I am assuming these people were thinking about our taking on the hard work of starting a farm to sell commercially so late in life). "Creating a healthy community is a two-way street." And there is a lot of back and forth activity on that street that for us starts with how we care for our soil and ends with the enjoyment we get from handing off our garlic (and the Etc! on our Garlic, Garlic, Garlic, Etc! banner) to our customers, our eaters, our community. Yes, enjoyment is what we feel and experience deeply when we meet our customers who are putting faith in our work and taking home the 'fruits of our farm', which is one more necessary step on that busy road of contributing to the creation of our healthy community. Who would have guessed? :) The deep enjoyment that comes from knowing we are doing our small part in our small part of the universe to create and nourish a healthy community (starting with our soil and the land's community) gives us deep purpose. We are not 'selling to the river' but to our own local community. People with faces, in fact, people with smiling faces! We like being being part of our community on this two-way street. Being fully there, in the fields, at the markets, even at the computer researching this or that, and then meeting you gives us happiness, which is the difference between "have to" and "want to". PS - I changed the photo on my blog's header a few days ago. It's not a great photo, but it shows 24 of the 29 sandhill cranes that were flying over our farm last week, circling in the updraft that would get them to the air current they needed to start flying south. It's about time! The marshes are finally (beyond) ready to freeze, and we hope they will be snow-covered this year. Our land, our waters, and our various plant and animal communities need a return to cold, snowy winters for our land's health here in the Upper Midwest! This morning was an unplanned 'lazy (rainy) morning'. Of course there is work to do in the barn (and I could always vacuum up the dog fur in the house - smile), but my husband and I both agreed that the barn work was not urgent, and the fur will also need vacuuming tomorrow, so instead I did some reading from one of the books that I requested this week from our library. I am reading For the Health of the Land, previously unpublished essays by Aldo Leopold (author of A Sand County Almanac which I cited in my previous post about World Soil Day), edited by JB Callicott and ET Freyfogel (1999). Every time I read Aldo Leopold's words I learn more about his views of 'land health', which can be illuminating, satisfying, and unsettling, particularly because the farmer is the focus of most of his later writings. To give these insights time to percolate, I began perusing my blog stats, looking for the recipe with the most views. I only took the time to look back through my posts in 2012 and found this one for Kale-Mushroom Strata (I hope I have put this on my kale blog, too), which has a ton of views for some reason! When we put on the apron, we are nurturing. This is not work; it’s love. Carol Nicklaus - Danbury, Conn.
As I think of cooking and farming, they are both love, not work, at least not 'drudgery'. Both involve nurturing our various communities, including our 'land community' to which Aldo Leopold addresses much of his writing. Both take time and intention, both take a spirit of adventure and curiosity. There may be guidelines but there is no real definitive 'cookbook' for either pursuit. To be successful at each in the deepest sense requires that the 'product' not be measured only in terms of 'yield' but the contribution to the commons, the common good, the commonwealth, commonweal, or our common health. I hope that the preparation of all the recipes on this blog contributes to your community's health, indeed your commonwealth. Q - Have you continued with the living traditions you outlined in Animal, Vegetable, Miracle, or have your habits changed since then? A - The way we eat as a family is the way we live in general. We try to avoid excessive consumption in every way, of resources, of fuels. The process we described in that book, of eating deliberately, of tending to the sources of our food, was very gratifying to us. It was a wonderful exercise both emotionally and socially to engage with the farmers in our region, to learn about the provenance of our food. It’s something we couldn’t go back on. When you have a conversion like that, you don’t leave it. We do what we do because it makes us happy. Secret revealed here - during the years I traveled around the country speaking (long before I started this blog in 2007), I had this wild fantastical hope that I would walk onto the airplane, find my seat, and see Barbara Kingsolver sitting next to me. Gasp! I don't know if I would have even had the courage to speak to her, the desire to interrupt her privacy, knowing it was possible I might reveal to her that I wrote a book but I am a 'small author' compared to her influence, that over the years I have spent more time reading professional journals/research than literature but somehow I found her books devouring every one she has written, reading or listening to several more than once, even before she wrote my favorite book of hers, Animal, Vegetable, Miracle. People often ask me where to start reading about the 'local food movement', whatever that phrase and concept entails. I could say read Animal, Vegetable, Miracle by Barbara Kingsolver. However, I don't (that comes 'second'). I say "Don't start by reading! Instead, first start by doing! Start by eating and tasting the difference between a food locally grown versus that same food shipped in from another part of the country (or the world)! To do that, shop at your local farmers' market this week, look around to see what is being offered this week (i.e. what is 'in season'), choose one favorite food that you see for sale, introduce yourself to the farmer, thank him or her for growing it, and then bring that food home to cook, eat, taste, and celebrate." I will interject here that every market has different goals and 'rules' about who may be a vendor and what they may bring, so it is important to either ask the farmer (or the market manager) where the food came from to ensure you are purchasing something grown by that farmer. Eventually, you will start asking questions about a farmer's agricultural practices, how the food was grown (signs that say "no spray" really don't mean very much - even I don't know how to interpret that phrase!). Please don't be shy about asking these questions. We welcome them, embrace them, which gives us a chance to discuss and share with you the love and deep sense of responsibility we have for our soil, our crops, and the health of our community. Second, purchase or request Animal, Vegetable, Miracle from the library (it is also on CD with Barbara Kingsolver reading it herself). To understand more about this phrase "the local food movement", savor this book, do not race through it. Try several of the recipes contributed by her daughter Camille. Read and re-read the succinct sidebars written by her husband explaining some of the complex concepts involved with our current agriculture and food system and the benefits of changing to one that is more local, more regional, more involved with a sense of place and a sense of provenance as Barbara Kingsolver noted in her response above, which I understand to be both valuing and bestowing a sense of authenticity to our foods' origins. Yesterday December 5th was World Soil Day, a day to value and celebrate the few top inches of planet Earth, our home as humans beings, as a most precious natural resource that without proper use and care, civilization as we know it will not continue to thrive, and may not survive (Dirt: Erosion of Civilization by David Montgomery is one of the most informative and powerful books I have read). Our love of growing healthy food for our local community starts with our love and respect for the soil on our own farm and encompassing and embracing the community of wild things that live in our soil and on our farm. Nourishing and restoring the health of the soil on our farm, our local eco-system, is our "Job #1". Doing so also brings us full happiness. I don't know the history of World Soil Day and have not had time to look it up right now. However, I am grateful that someone somewhere had the wisdom, foresight, and know-how to have a day set aside globally to raise awareness and celebrate our soil. I have not seen bumper stickers that say "No Soil, No Food" but in a nutshell that is the message of the book Dirt: An Erosion of Civilization by David Montgomery mentioned above. A better bumper sticker would be "Celebrate Local Soil and Foods", which may be too corny and/or long to put a bumper sticker, but you can see where I am going and what we strive for on our farm. through a circuit of soils, plants, and animals. The current most popular posts - holiday desserts! Why am I surprised? :) I am getting ready to make these two recipes myself, so I want to give you the past links to the two most requested posts (i.e. both are holiday recipes) on my blog at the current time. (2) Date Pinwheel Cookies - another family favorite and long-standing family tradition. The link above shows the step-by-step directions for making these time-consuming but irresistible cookies. My mother no longer bakes them but she is thrilled to get some in her Christmas stocking every year. :) The dough can be made ahead, frozen into logs that are ready-to-slice-and-bake whenever you need them (including Christmas Eve to leave for Santa). Oh, yum, yum! Both of these recipes have been tweaked over the years to make them as 'healthy' as possible while not sacrificing one bit of their melt-in-your-mouth deliciousness. I'm sure that somewhere on this blog I have discussed my philosophy about the word 'diet', believing that a 'diet' is much more than the food we eat and no where in my mind is there the word or concept of 'cheating'. The Old Middle English definition of the word 'diet' actually defined diet as 'a day's journey'. I like this, I like this a lot! So, knowing that food nourishes both the body and the soul (being far more than just biochemistry), I hope you will enjoy and savor these two delicious holiday traditions as much as I do, not only as part of 'day's journey' but part of a 'year's journey', too. What foods are traditions in your family that you cannot give up (nor should you) that are also foods you have tried to make a teensy bit healthier while still enjoying their taste and connection to your past? I would love to know. Feel free to comment, complete with recipes! Apparently one of the writers at the on-line newspaper the Ann Arbor Chronicle reads my blog and thought comments and photos in my last post about the piles around our farm was 'news-worthy enough' to re-publish. I have enjoyed reading this grass-roots source of what's happening in my neighborhood since its initial launch in September 2008. Really, I just had to laugh. I never expected to make the local news for our piles of stuff! So I conferred with my husband for tonight's update. Piles, piles, and more piles. I realize I forgot to mention that we also have piles of trickle tape for our irrigation next spring, piles (now neatly stacked) of crates for storing and carting around our garlic, piles and piles and piles in the loft of our barn of garlic papers and garlic stems left over from tearing apart our seed stock before the fall planting. Our dog Phoebe has enjoyed creating and using her 'nest' made from these garlic left-over piles (see photos below), but this week we are going to work on cleaning up these piles because we actually have a plan for re-using all of these piles of the garlic left-overs. We also have piles of spent coffee grounds that we pick up from Moonwinks Cafe every day that we will use as mulch on our hops next spring plus piles of leaves that fell and are now trapped inside our fenced family garden, which will be used to mulch the paths next spring/summer. Last but not least, we still have piles of unpacked boxes in our basement, garage, my husband's office, and one upstairs bedroom. In all fairness however, we do have fewer piles of unpacked boxes than at this time last year, and our big piles of sand and drainage tiles are gone because those projects have been completed without left-overs. In addition, our pile of 60 bales of straw delivered earlier this fall is also gone because 100% has been used to mulch the garlic we just planted (we do need to order more, so it is likely that we'll have a small pile left over to store on our barn porch this winter). I want to end by highlighting the loft that our sons built us this past summer (see photo below) to organize and hold our very important pile of scrap lumber. So, we do still have an enormous pile of lumber (needed to build our upcoming chicken coop - my husband is looking at plans right now), but at least we can see what we have now. 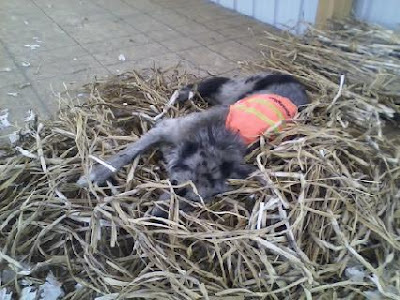 Phoebe keeping me company as I work in our barn loft by lounging in the 'nest' she made of garlic stems from the soft-neck garlic varieties. 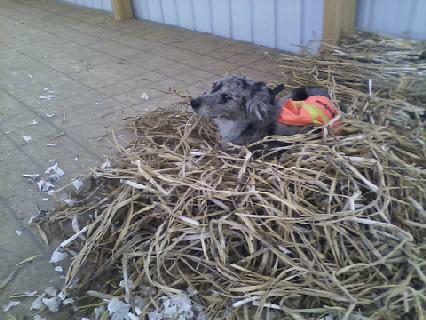 Piles of stems from the hard-neck varieties - which would not be cozy to lie in - are stacked up behind her. Phoebe looking like a loon on her nest (wearing her orange vest during hunting season) making me laugh at her silliness. Our newly constructed loft built into the equipment porch of our barn to store our scrap lumber piles - designed and built by our two sons last summer. They saw a serious need and then took charge to 'get it done'. Yes, we are a real farm. We have heard occasional comments referring to us as 'hobby farmers', even 'gentlemen farmers'. No, I don't think so. :) :) We have a lot going on here. Come spend a day with us, or a week, or a month. We work so hard every day (our bodies and our brains) during the growing season that the dietetic student who lived and worked with us for two weeks last summer went home to rest! Here is the link for the final 2012 farm newsletter. We have lots of winter projects (both inside and outside), so we'll continue to be very busy, but it feels very good to have our 2013 garlic in the ground and mulched, with the big push finally done for 2012. 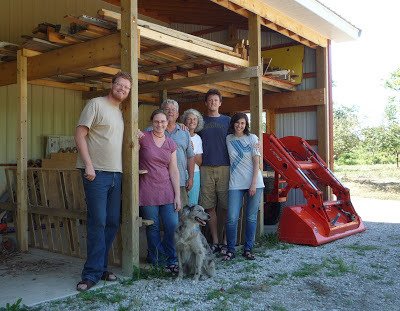 The newsletter has a few photo updates plus information about a private garlic tasting event we will be hosting at our farm as a silent auction fund-raising event for a local non-profit organization Growing Hope . If you live in the Ann Arbor area (or have friends or family who live here), please consider bidding on this item (sneak preview - here is the direct link). As the auctioneer says at auctions, "Please bid high and bid often". All money goes to Growing Hope, a very worthwhile local non-profit organization dedicated to helping people in Ypsilanti, Michigan improve their lives and their community through gardening and increasing access to healthy foods. Tonight we'll be unpacking some of our holiday decorations. It is almost surreal (and very exciting!) that we have already bought our Christmas tree. Here is one photo of our barn at sunset (sorry the real 'glow' is behind me), but I love this photo because it shows that we have actually had time to even clean up our family garden, too, something that never got done at all last year (we planted around a lot of weeds this year, including 2011 corn stalks - ha ha - oh well!). Here is a new recipe I tried last week (before Thanksgiving). Since it is now getting dark so early in the afternoon, we quit our outside work much earlier than during the summer, which means 1) we have more time to cook at the end of the day and 2) we are not (usually) too tired to do so. Peel the outer skins off the tomatillos and blanch in boiling water 4-5 minutes. Add roux to sauce, salt to taste, set aside. Cut squash in half lengthwise to clean out the seeds (save them). Place squash on a baking tray (on parchment paper) and roast until soft, 40-50 minutes. Let cool until you can scoop out the meat and then mash until lumpy, not completely smooth. Add squash and black beans and set aside. Quickly dip the tortillas in the tortilla sauce to soften them. Place on a plate. Divide up the filling into 8 equal portions right in the saute pan. Bake at 350 degrees for 15-20 minutes until hot and bubbly in the middle. Serve with a fresh salad and other vegetable plus some guacamole. Beautiful and delicious! The enchiladas baked and ready to eat! A perfect winter night meal - I am sure we will make this again, even for company. It was that good! Happy Thanksgiving to all my readers! I know I have been absent a lot from my blogs, but I could not let this holiday go by without sharing and joining all of you on this day with gratitude for so much in life. We are really close to having all of the garlic in the ground for the 2013 harvest - yea! All that is left to do is treat some of the diseased garlic we separated out from our precious seed stock (arghhhh) and plant it in a separate part of the field to see what will happen next year. If it is healthy and thus edible, we will eat it ourselves and not sell or plant it again. We are grateful to know that our crop failures this year were only partially due to our own management and mostly due to the perfect storm of weather conditions starting last fall that created the optimal growing conditions for a full-blown infection from a common soil fungus that hit garlic growers across the country causing significant crop losses. Some of our varieties had a 40% loss in the field and even some of our perfect seed stock (the best of the best) showed signs of the infection when we started to tear them apart to plant with about a 10% loss overall. Some of that is what we will experiment with and only use for our own family garlic. Of course, best organic practices include rotating fields, which we have done and which we will continue to do on a 5-year schedule, but because it is weather conditions that are the baseline culprit, we will be even more attentive at all phases of the growing season next year to minimize the infection's cultivation and spread and resulting financial loss. We have lots of winter projects that need our attention, so we will be switching gears next week to those. Combine all in a heavy pot and bring to boil. When the berries have burst, take it all off the heat and submerge the pan in an ice bath in the sink to cool. This recipe freezes well and can be used in all sorts of imaginative ways to spice up and dress up other dishes. Last, a poem by Robert Frost along with the last lines of a poem by Mary Oliver seem perfect for this time of year, giving thanks for the abundance we have in our lives. we eat the blessed earth. Happy Thanksgiving to you all. I'll be back more often in December, I promise! I was finally reading a booklet I purchased at an organic farming conference called Growing and Using Garlic, A Storey Country Wisdom Bulletin. Looking through the recipes, I saw one I did not recognize, Skordalia, which is a Greek recipe typically made with potatoes as a base (but not always) that is considered a ‘comfort food’. It is used as a dip or a sauce, but in either case, with lots of added garlic. The word skordalia comes from a hybrid of ‘skor’ (Greek for garlic) and ‘dalia’ (Italian for garlicky). So there you have it, ‘garlic-garlicky’! How in the world did we miss this dish all these years? It makes me wonder what else is still new in the world to us. When the potatoes are cool enough to handle but still warm, scoop out insides. There should be 2-3 cups of potatoes. Mash the potatoes, add garlic, and red wine vinegar. Slowly add the olive oil, continuing to mash, until mixture is blended together and a little thinner than hummus. I’m going to also have fun making this dish using bread and/or walnuts as a base. In any case, Skordalia will become a staple in our list of ‘go-to’ recipes. I served it as an appetizer before going out to eat with friends. I wonder how to say ‘Pretty Good!’ in Greek! The smashed garlic ready to add to the mashed potatoes along with an example of the size of the three garlic cloves I used, which would be close to the typical size of 10-12 cloves. Skordalia topped with a drizzle of olive oil, garnished with the tops of fall green garlic and surrounded by roasted beets ready to serve as an appetizer with great friends and great beer. Equals the true cost of cancer on an annual basis in Europe. What does that translate to in US dollars? Here is the current conversion rate today (1 US dollar = 0.7679 euros) so it is clear that $124 B figure is even more staggering when translated to US dollars, which would equal $161 Billion USD. $161 Billion each year..............the true cost of cancer treatment and cancer survivorship (and/or lack of it) concerns, all rolled up into one crushing figure. What else could be done with that money? Our customers also come from all parts of the economic-spectrum of our community; they are not just from the 'high-end'. Many of them use food assistance programs to purchase our garlic, and we participate with every program possible. It is the increase of all individuals who become committed to doing more purchasing of locally grown organic food, supporting local organic farmers, growing the local economy, plus just as importantly, enjoying cooking with healthy foods along with eating with family and friends (reducing the 'grab and go' mentality of our unhealthy processed and fast food society) that we are intentionally working to nourish and cultivate. Here is the last farm newsletter for 2012 along with a list to links of all the newsletters I wrote for our farm in 2012 (I just found this!). Now on to planting our garlic for 2013, but first, i.e. today, we really need to finish the harvest of our family garden. A good (bad) frost is expected tonight, so we need to keep focusing on bringing in our own food rather than what we need to plant for our income in 2013. Where to spend our time is always a balancing act! Here is a great article in the New York Times about a celebration of organic farms, farmers, and food in Maine. There are so many great 'one-liners' in here from the farmers themselves (not the writer) that truly give an accurate picture of this life, why people are doing it, and why it is vitally important to the health of our communities. "I want to take a nap" is one of them :) but we won't get to do that until after our garlic is planted. I have not had time to weigh in on the recent uproar over 'the Stanford' study that showed 'no benefit' to consuming organic foods. I still don't have time to do a thorough discussion, but I will easily say I don't agree with their conclusions at all. I can also say with complete truthfulness that my husband and I have thrown our hat in the ring for the long-haul and have no plans to move or do anything else in the future. We see the future and want to help create it, thus the motto for our farm became "Shaping our future from the ground up", where "our" is intentionally very large, very inclusive, starting with our soil and simply widening up and out from there to include our family, our community, our State of Michigan, my profession (dietetics) and our other health care professions, and society at large, i.e. finding, cultivating, and nurturing our "common ground". I hope you can take the time to read the article.